Has the city life been getting the better part of you? Tired of traffic, construction, and noise? We have a simple solution for you: take a run, walk or bicycle ride on the Musketawa Trail. Our insider tips will have you appreciating and enjoying everything the trail has to offer. Join Blu House Properties as we take you on a journey down one of West Michigan’s favorite trails! Located in Ottawa and Muskegon counties, the Musketawa Trail is a 12-foot-wide, 25-mile-long, four seasons multi-purpose paved trail stretching from Marne to a trailhead just east of Muskegon. 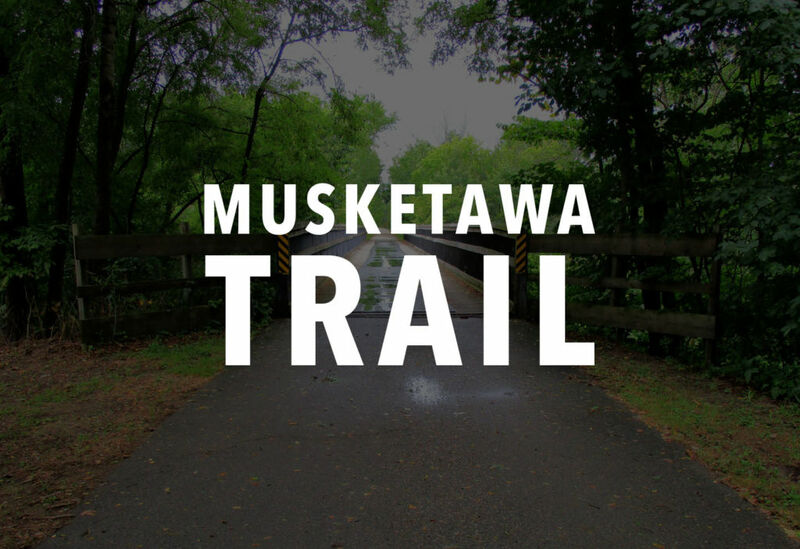 Envisioned in 1990 as the best use to convert an old railroad grade to a multi-purpose trail, the Musketawa Trail was formally dedicated in 2000. Starting in Marne, the trail passes scenic farmland, wetlands, orchards, and woodlands. The trail passes through the small towns of Conklin, Ravenna, and Cloverville before its terminus just east of Muskegon. Whether you are looking for a fast-paced, 25-mile bike ride or a slow-paced, leisurely walk, the Musketawa Trail offers something for everyone. From horseback riding to cross-country skiing to bird watching, you will find it on the trail. For nature lovers, you will find a diverse spectrum of wildlife, including bears, birds, coyotes, snakes, wild turkeys, and deer. When using the trail, keep the following etiquette in mind: respect private property, don’t disturb animals or vegetation, no littering, clean up after pets and dispose of pet waste properly, stay to the right of the trail and pass to the left, say “passing to the left” when passing pedestrians with a bicycle and stepping off the trail when not actively using it. Following these etiquette suggestions will provide a safe environment for all users for many years to come. We hope to see you on the trail soon! Learn more about the trail here.